We all remember when we met that special person. The flush of excitement of that first time for everything will stay in our memories forever. The hard part comes next. Now you must live with that person. You hope you have chosen well because that initial elation is buried under daily responsibilities. The laundry must be washed and the garbage must be taken out. That original thrill is sometimes buried in a mountain of must do’s. You must make the beds. You must clean the potty. You must take care of that crying child. Those things are not more important, just more immediate. They will not take care of themselves and the responsibility is yours. It may feel as though you are being pulled in a million different directions. But you are both heading in the same direction all the time. Down the path of marriage and towards old age. It is not a bad thing. We all get older. It is a matter of who you want to take the journey with. If you chose well, your significant other will understand and be right there next to you the whole time. You do not have to face daily problems alone. That is why you each chose each other. Now is not the time to make incriminations. Now is the time to pull together. The first stirrings of love were probably more of passion. That may have waned but your love and dependence will grow. Without life’s difficulties, how would you know of life’s pleasures? In relationships that are made to last, it is not the passion or physical appearances that define your life together. It is the little things that make it all worthwhile. You know you are both meant to grow old together. You both you can still spend hours just talking together and not being cognizant of the passage of time. When you first meet and the passion is strong, choose carefully so you will both love each other when the material things are gone. You will need each other more then than you do now. When you are older you have to take care of each other. Now is when you find out how important you are to each other and how much you are willing to do for each other. In long-term relationships, it’s not the passionate peaks or intensity that makes love endure or grow; it’s the small day-to-day kindnesses, sacrifices, and compromises that strengthens the bond between a couple. If you are always thinking of your significant other and he or she is always thinking of you, both will come out ahead. Now it is just the two of you. 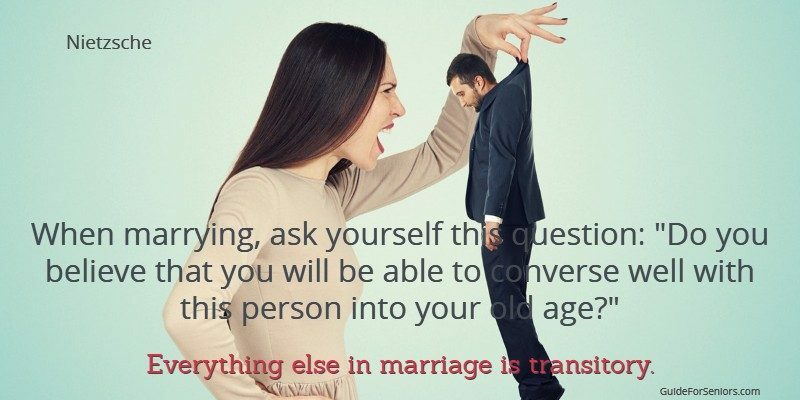 Remember “Everything else in marriage is transitory. Read more about seniors and anti-aging on Guide For Seniors .